Lake Istok ...Learn more here! A popular site for both tournament and non-competitive anglers, this 27,480-acre eutrophic body of water, located southeast of Sebring, is now under the Florida Game and Fresh Water Fish Commission's (GFC) TEAM (Team Effort Accomplishing Management) banner. GFC Biologist Tom Champeau, Istokpoga's TEAM project leader, rates bass fishing as superior, crappie output as better than average and bream (bluegill/shellcracker) activity just a tad below the .500 mark. 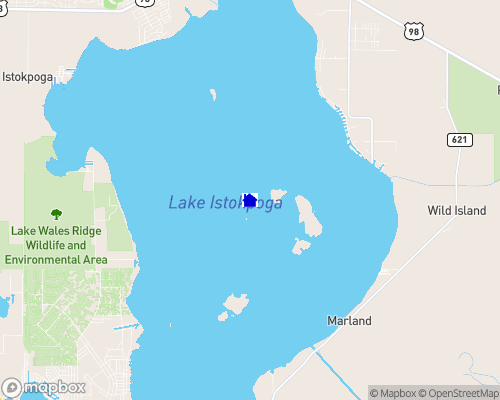 Located five miles northeast of Lake Placid, Highlands County, this 27,692-acre lake has quality fishing for black crappie (specks) and one of the highest largemouth bass catch rates in the state. The best speck fishing occurs during winter months drifting over open water, particularly in the northeast and southwest corners. Predominant aquatic vegetation includes spadderdock (bonnets), bulrush (buggy whips), cattail, and pondweed (pepper grass). Kissimmee grass on the south end is particularly productive when there is flow into the Istokpoga Canal. This canal, located off County Highway 621, provides excellent largemouth bass fishing from the bank when the gates are open. Arbuckle and Josephine Creek mouths are also good areas when there is flow. The island areas and associated grass can hold bass any time of year and the deepest portion of the lake (10 ft) is in the southwest corner. Public boat ramps are located on the north, northeast, and southwest shorelines off of U.S. Route 98, Lake Boulevard off Cow House Road, and Highland Lake Drive off of County Route 621, respectively. There are also six fish camps/resorts on the lake with various accommodations. Anglers can wade fish off of the Cow House Road boat ramp. Visit Friends of Istokpoga. A nonprofit Florida corporation dedicated to saving Lake Istokpoga from harm.